Okay, so I’m not actually racing the Boston Marathon in 30 days. But you know I’m working hard to make Boston a reality in 2014. All my current training’s aimed at making this goal come to fruition. So, when Ty – who writes at SeekingBostonMarathon.com – invited me to join his #30DaysToBoston #PhotoChallenge, I couldn’t refuse. What an exciting way to help this year’s Boston Marathon runners celebrate their final days of training. And, what a fantastic way for me to stay focused on earning my Boston Qualifier in April at the Eugene Marathon. Each day there are hashtags related to the race for which you post a picture. 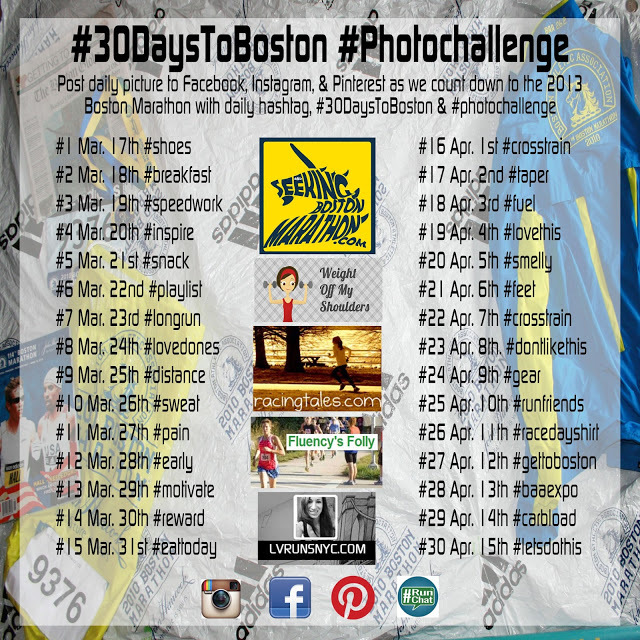 Along with the daily hashtag (see list – click photo to enlarge), we will include #30DaysToBoston, and #Photochallenge. You can post the photos on your chosen social media sites of choice. Join in! I know lots of speedsters running Boston this year (awesome!). And, I know quite a few of you who are just like me – striving to turn your Boston dreams into a goal achieved. I’ll be posting my photos here, and on Instagram, Facebook, Twitter, Pinterest, and Daily Mile. Ty, thanks for the opportunity to participate. I can’t wait to see how everyone unleashes their creative genius, and hear how they crush Boston on April 15! 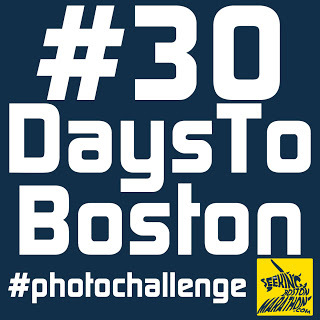 #30DaysToBoston starts on Sunday, March 17. Get your cameras (admit it, it’s your iPhone most likely) ready…it’s time to get all photographic. Love following your Ironman training, as well! So, so inspiring!